This book takes readers on a fascinating journey around five Asian centers of contemporary art and its myriad institutions, agents, forms, materials, and languages, while posing vital questions about the political economy of culture and the power of visual art in a multi?polar world. He analyzes the financial powerhouse of Art Basel Hong Kong, new media art in South Korea, the place of the Kochi Biennale within contemporary art in India, transnational art and art education in China, and the geo?politics of art patronage in Palestine, and he develops a highly original synthesis of theoretical perspectives and empirical research. Drawing on detailed case studies and personal insights gained from his extensive experience of the contemporary art scene in Asia, Professor Harris examines the evolving relationship between the western centers of art practice, collection, and validation and the emerging ?peripheries? of Asian Tiger societies with burgeoning art centers. And he arrives at the somewhat controversial conclusion that dominance of the art world is rapidly slipping away from Europe and North America. 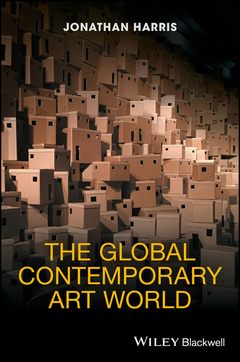 The Global Contemporary Art World is essential reading for undergraduates and postgraduate students in modern and contemporary art, art history, art theory and criticism, cultural studies, the sociology of culture, and globalization studies. It is also a vital resource for research students, academics, and professionals in the art world. JONATHAN HARRIS is Head of Birmingham School of Art at Birmingham City University, UK. He has taught and lectured on modern and contemporary art at universities, museums and galleries worldwide for over thirty years. His The New Art History: A Critical Introduction (2001) remains a classic text, and he has published twenty books as editor, author and co–author, including Globalization and Contemporary Art and The Utopian Globalists (Wiley–Blackwell, 2011 and 2013).